On January 14, 1942, representatives from the nine occupied countries met in London to draft the Inter-Allied Resolution on German War Crimes. At the meetings in Tehran (1943), Yalta (1945) and Potsdam (1945), the three major wartime powers, the United States, the Soviet Union and the United Kingdom, agreed on the format of punishment for those responsible for war crimes during World War II. France was also awarded a place on the tribunal. The legal basis for the trial was established by the London Charter, issued on August 8, 1945, which restricted the trial to "punishment of the major war criminals of the European Axis countries." 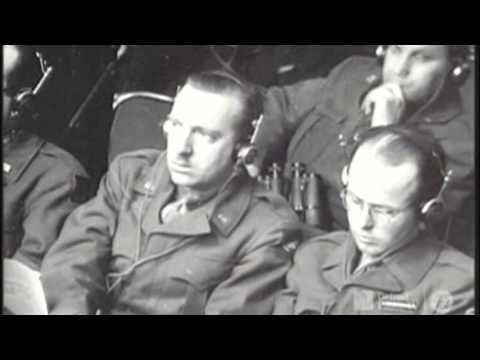 Some 200 German war crimes defendants were tried at Nuremberg, and 1,600 others were tried under the traditional channels of military justice. The legal basis for the jurisdiction of the court was that defined by the Instrument of Surrender of Germany, political authority for Germany had been transferred to the Allied Control Council, which having sovereign power over Germany could choose to punish violations of international law and the laws of war. Because the court was limited to violations of the laws of war, it did not have jurisdiction over crimes that took place before the outbreak of war on September 3, 1939. And whereas international solidarity is necessary in order to avoid repression of these acts of violence simply by acts of vengeance on the part of the general public and in order to satisfy the sense of justice of the civilized world.